Some of the latest testimonials about vBulletin 5 from license holders. Summary, do not buy! You may have noticed today (August 8th) we attempted to give you users some much wanted change to the forums. What better way than to get you guys the latest and greatest: vBulletin 5! Boy was I wrong. After purchasing and then slaving away at getting it up and running (it took me 8 straight hours through the night to get it up) all it did was give us troubles. vBulletin 5 is so poorly coded that we were forced to revert back to the current forum you’re on this very moment. I wanted it to work, I truly did. However the staff and I decided that it was just impossible. 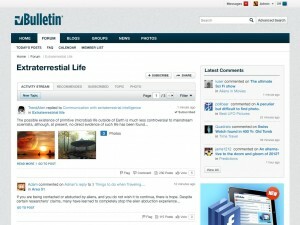 vBulletin 5 is riddled with bugs and poor coding, everywhere we looked there was something going wrong or something missing, it was truly horrific. I was genuinely upset that I put the forum in this position, I felt like I was screwing everyone over even though at my heart I was trying to just give some change. But we’re back! And I managed to keep the damage to a minimum. All we lost was essentially a couple of posts from the vBulletin 5 version of the site, which were basically all complaints anyway. If something is wrong with your account please let me know as soon as possible, I’m pretty sure I recovered everything correctly but, as we learned with vb5, you just never know what’s going to happen. Thanks for sticking through it, and hey! Modio was only down for like 10 minutes anyway, so that’s a plus! vBulletin 5.0 – It’s Crap.